Turns out the benefits of having a big brother is that he will teach you songs like this so Peyton has learned all the verses and happily sings it with Austen. Oh and she likes to put his underwear on her head. The pair in the photo is clean thankfully. I didn't realize how much we missed the snow this winter until it finally snowed a good bit on Friday. Never mind that the onslaught of this white stuff canceled my flight home from DC on Friday but it was still good to see....just wish it had come on a different day! 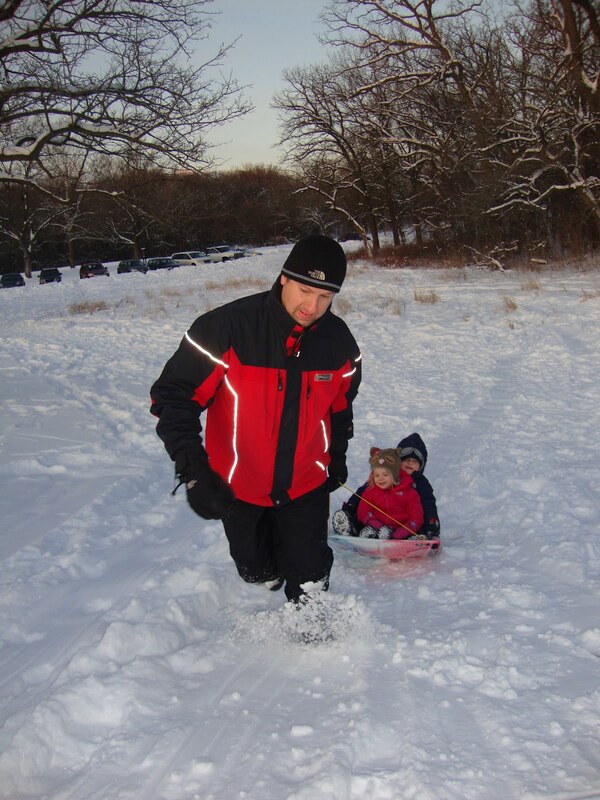 So on Saturday, Peyton had her first sledding experience. She was a little unsure at first but once she saw Austen do it, she decided she liked it and you could hear her laughing all the way down the hill. 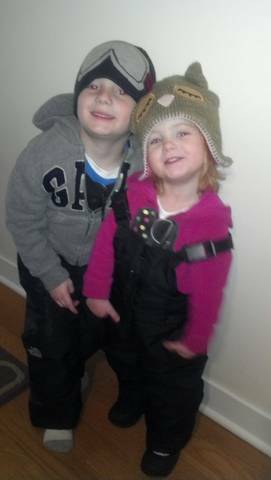 She especially liked sledding with her big brother and going down face first. Austen enjoyed sledding and wanted to hog all the sleds. He even decided to take a particularly steep slope into a bunch of snow. Now, I told him not to go face first but he insisted and got a face full of snow which made him immediately start crying. All I could do was laugh as I helped brush the snow out of his jacket and off his face and tell him, "I told you not to go face first!" I think it will make him a little tougher anyway when he gets around to skiing. There will be many face plants as he learns so he had better get used to it! I always told my mom that it's sort of like her birthday too when my brothers and I have our birthdays since she was the one giving birth to us. I feel like that with Austen and Peyton too. Those days were such huge, life-changing events for us that celebrating him turning five takes me back to the night before when we went to the hospital and those snapshots of memories I have in my mind from that day. I can't believe that was five years ago. Austen turned five this week and celebrated the whole week long. First, we took him to dinner at the Rainforest Cafe with Papa. This was his request - actually he said I want to go to the restaurant with the frogs. We drive by it at least once a week when Tom drives me to work and he remembers that we went there for his birthday last year. Anyway, he loved the elephants and even petted them. He liked the gorillas too but wouldn't pet them according to Papa. Maybe it was because Papa faked the gorilla biting off his finger! Peyton on the other hand clung to me for dear life the entire meal. She did not like the elephants! The good part of this was I actually had an enjoyable meal without having to keep her from wanting to roam the restaurant. Wednesday, Austen's actual birthday kicked off with muffins at school where they celebrated by singing happy birthday complete with five hip, hip hoorays! That evening, Austen got to go to his first Chicago Bulls basketball game with his dad and Uncle Bob and Aunt Maria. Just when you are thinking his birthday has to be over, he had to enjoy his birthday party with his friends on Saturday. They made stuffed animals, people or whatever they wanted. Austen requested a cookie cake as he tells me he doesn't like regular cake especially the frosting! I think he had a good birthday week and I for one am glad all the celebrating is done and I have nothing to plan for the next 10 months of the year! I'm talking about Peyton. She definitely has entered the terrible twos and is giving us a run for our money. The past two weeks she has been especially challenging and what worked for Austen does not work for her. It just goes to show you how different two kids can be. First, the potty training. Austen potty trained at 25 months in three days and just got it. Peyton had all the signs that Austen did not that showed she was ready like wanting to sit on the potty and being able to talk. She clearly understands the concept but it took her a lot longer and it is still a work in progress. More like two weeks before she went dry for a whole day. But she has gotten better which is good. Second is the bed. We got her a big girl bed during the time we were potty training her. Now I didn't do this with Austen. I waited about two months after he was potty trained but Peyton had been waking up pretty consistently throughout the night since Oct. so I figured we were already not getting a full night sleep what is one more thing to add to it. Austen wasn't that great in the transition to the bed thing. He wanted us to be in his room or right outside his door and Peyton is the same way. Wants the light on, a drink of water, has to go to the bathroom, etc. I am slowly remembering that Austen did much of the same. But I'm older now and probably wiser and a little less tolerant of this going on for 45 minutes. We're still trying to test what the perfect solution to her resistance to bedtime is and hopefully it's not just letting her grow out of it! Third is that she's a tough girl. She likes to rough house with her brother already. Just today she got sent to timeout for hitting him and then biting him! She can certainly make him cry. And when you try to punish her for it she gives you a laugh and thinks it's all funny. Putting lemon juice in her mouth like we did with Austen doesn't revoke any reaction from her in fact when we threaten her with it, she asks for it. I think we might need to switch our strategy on that one! It gets easier right?! I know it does but right now she's giving us a run for our money. 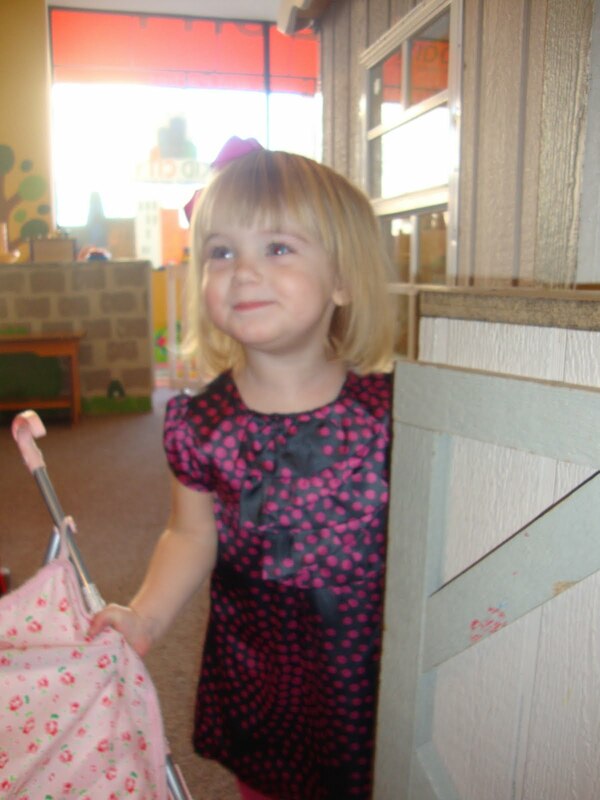 On Friday, Peyton turned two. And since this year we didn't jet set off to somewhere after the holidays, we decided to have a day of fun things to do on her special day. We started the morning off by going to breakfast (really the cleaning ladies were coming and we had to get out of the house and breakfast was the perfect excuse). We then headed to the theater where we saw a late morning children's play based on the book "Give a Cat a Cupcake" - one of her favorites. I wasn't sure how Peyton would do considering the play was 45 minutes long and she was potty training (more on that in a future post). But she did great. She sat through the whole performance (and didn't wet her pants!). From there we headed home for lunch, a nap and then headed out again to do last minute errands in preparation for her birthday party with friends and family the next day. We capped off her birthday with dinner out and cupcakes at home. Her party was a great success. I didn't see Peyton most of the time (which wasn't very helpful in the potty training department) but she had a lot of fun with her friends and family at a children's play space that had a family room for the adults to hang out in while the kids were playing. She got lots of presents from all her great friends and family and I'm thinking that we need a much larger house just to fit all the presents from her birthday and Christmas! All in all, she enjoyed her birthday - definitely knew it was her day. And only today did we break it to her after she started singing happy birthday to herself that her birthday is now over and Austen's is next. She looked disappointed at first but changed her tune to happy birthday Austen!